Nokia HERE Maps for iOS are now available in the Apple App Store. This provides another alternative for users still unhappy with Apple Maps app on iOS 6. Nokia HERE Maps for iOS are now available in the Apple App Store. This provides another alternative for those users who are still unhappy with Apple Maps app on iOS 6 – and the exclusion of Google Maps. Nokia’s HERE Maps app is compatible with iPhone, iPad and iPod touch devices running iOS 4.3 or later. The app is also optimized for the iPhone 5 display. 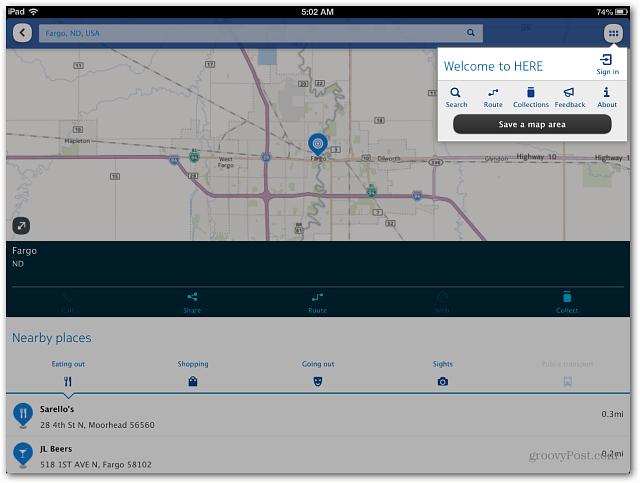 Nokia CEO Steven Elop announced bringing its HERE maps to iOS pending Apple approval earlier this month. The app includes what you’d expect including search, map view, live traffic, public transportation and satellite view. You can share places with a tap, including location, how to get there via SMS or social networks. Another unique feature is voice-guided step by step walking navigations through parks and other pedestrian routes. Until Google gets its map app on iOS, this might be a good alternative. Or you can always use the workaround to get Google Maps on the iOS Home Screen.